Yesterday, for the first time in about 25 years, I made chocolate éclairs. 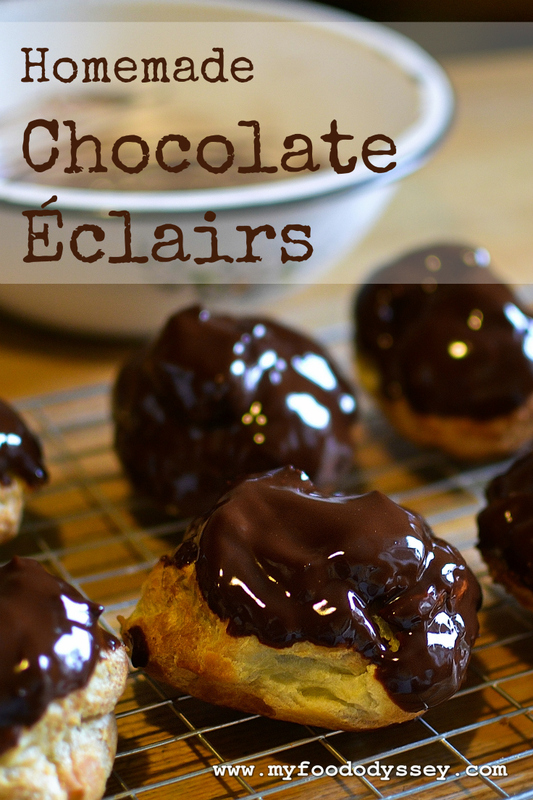 My love for éclairs began with my paternal grandmother, a rotund and (mostly) jolly woman who loved her cakes. Whenever we’d visit her house she’d always provide a large spread. Usually the main course would be a simple but satisfying salad – a rolled slice of home-baked ham, a few leaves of butterhead lettuce (from her city garden), some sliced beetroot and onion, half a tomato and half a hard-boiled egg topped with a dollop of mayonnaise. This would be accompanied by copious quantities of thickly sliced batch loaf, country butter and more mayonnaise. But the pièce de résistance, and the part of the meal (and probably the visit) that my sister and I most looked forward to, was the plate of cream cakes that awaited for dessert. My grandmother would buy a selection of cakes – cream doughnuts, jam doughnuts, coffee slices, vanilla slices and, of course, éclairs. No matter how broad the selection my sister and I would invariably want the same cake and a row would ensue. My father would eventually resolve the matter by suggesting that we share the éclair and one other cake. To ensure absolute parity the deal was that one of us would cut the cakes in half and the other would get to choose their halves. Thus, much valuable eating time was wasted with meticulous measurement to ensure half actually meant half. Somehow the half éclair never seemed to satisfy my needs and so I took to baking my own éclairs at home. They were actually easier than they looked and soon I could rattle out a tray with little thought or effort. But when I hit college and my tiny apartment didn’t have an oven, I stopped baking completely. Not having that much of a sweet tooth (apart from the éclairs), I didn’t miss baking and never really came back to it. Until, that is, I arrived in the land of the sweet-toothed, Lithuania. 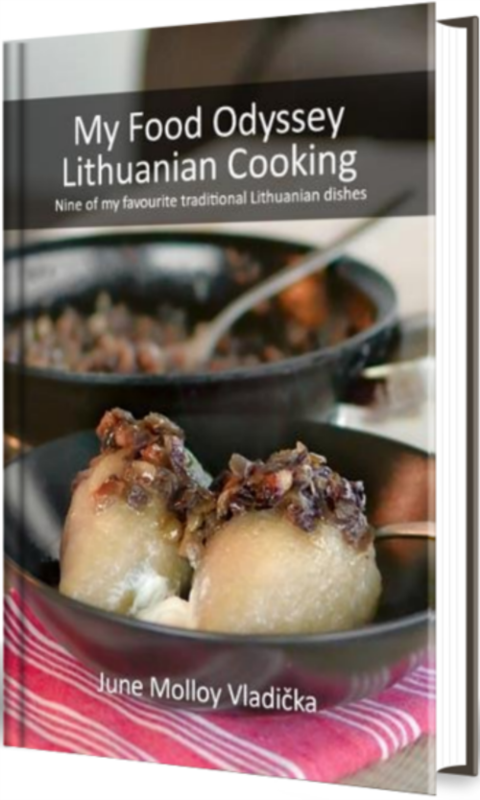 I read recently that Lithuanians don’t really eat sweet things and I snorted audibly. When I repeated the statement to my husband he made a similar sound. Lithuanians LOVE sweet things. Pop round to a friend for coffee and a bowl stuffed full of chocolate and biscuits will invariably be presented. To be fair, a bowl of fruit will also be produced, but there is no lack of sweet goodies. Now that I have a little more time available for cooking I am trying to reawaken my love of baking. However, as I approach middle age (gasp!) and need to keep an eye on my middle, I generally like to pawn my creations off on others. So, when I was invited over to my friend’s house for coffee yesterday, I jumped at the opportunity to bake. The text came through at 9 am and coffee wasn’t until 5 pm – plenty of time to create something beautiful. I decided on éclairs, remembering their simplicity, and set to work. My goodness, what a palaver. First, just as I was about to start, I discovered a flood in the bathroom which needed immediate attention. Audibly cursing the culprit (who wasn’t in the house, so I was wasting my breath), I set to work with the mop. Eventually I got my pastry made and piped and practically threw the tray into the oven. I had elected to make puffs rather than long éclairs as our oven only takes one tray and I could fit more puffs than éclairs on the tray. I set the timer for 15 minutes. The back of our oven browns food better than the front so everything needs to be rotated mid-cooking. 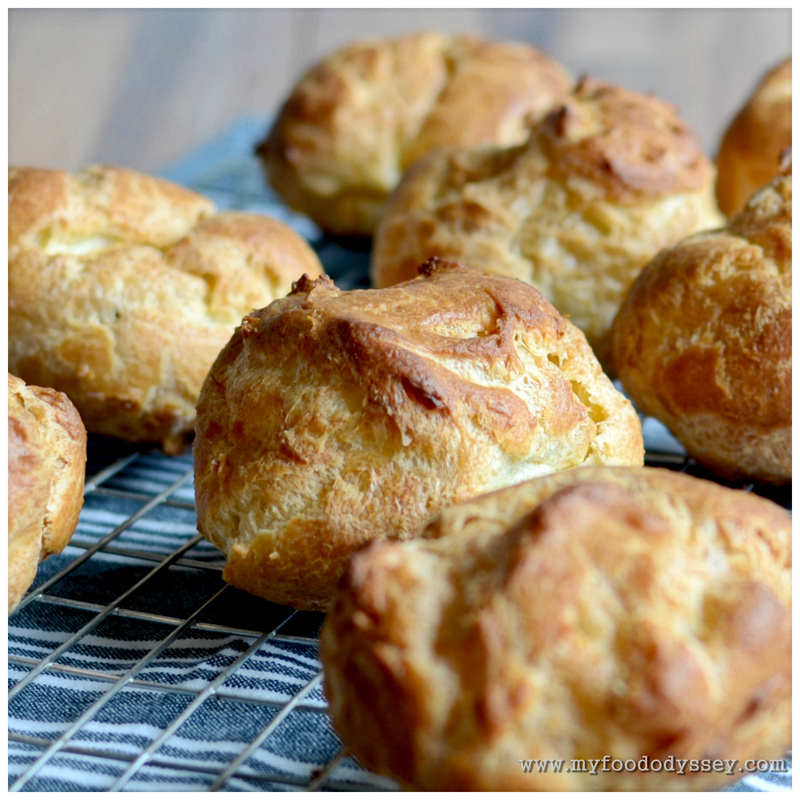 After 15 minutes I opened the oven to find the puffs looking exactly as they had when they went in. The gas was gone. Thankfully we had a spare bottle and after a quick scramble and some further cursing we were back in action. Inexplicably, the pastry puffed up to perfection and the éclairs came out golden and crispy. The cooking gods were with me. When my friend rang at 4:30 to say she was behind schedule and coffee would now be at 5:30 I was delighted. With chocolate everywhere, from my nose to my clothes, I needed the extra time. How on earth a simple plate of éclairs could have taken so long I cannot fathom. On the plus side, they went down an absolute treat and have been requested again as soon as possible. Floods and fuel shortages aside, I reckon these would still take about 2 hours as they take 35 minutes to bake and need to cool before being filled and iced. That said, they really are quite straightforward. The icing and filling would be good fun for kids, although do accept that your kitchen, and probably the child, will be covered in chocolate. Adapted very slightly from here. Preheat the oven to 220˚ C (425˚ F). Melt the butter in a saucepan over a medium heat. Add the water, turn up the heat and bring to a rolling boil. Remove immediately from the heat. Add the flour and salt and beat well with a wooden spoon until the mixture is smooth and comes away from the sides of the saucepan. Put the saucepan back on a low heat and stir for about 30 seconds, until it starts to fur on the bottom of the saucepan. Remove from the heat and allow to cool for about a minute. Add four of the eggs one at a time, beating thoroughly after each addition to ensure the egg is well combined. Break the final egg into a cup and beat well. Add the beaten egg to the saucepan little by little – use just enough to make a mixture that is very shiny and drops reluctantly from the spoon. 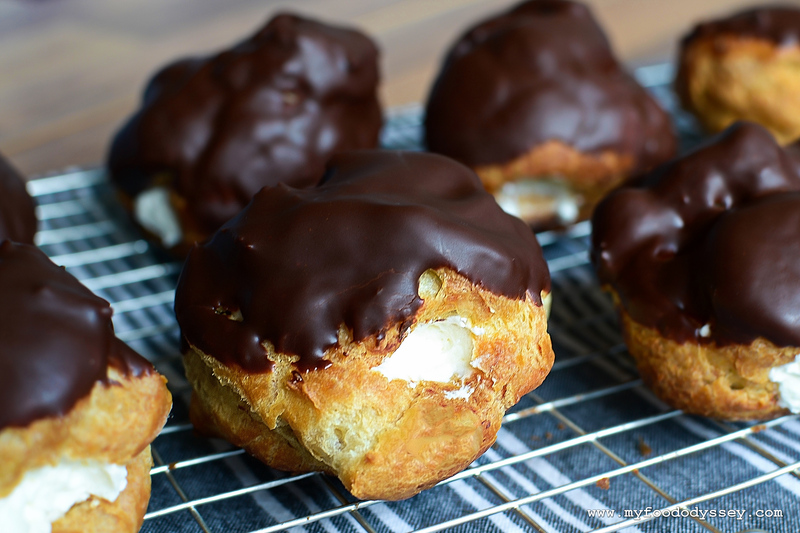 Fill the choux pastry into a piping bag fitted with a 2 cm round nozzle. Pipe the pastry into desired shape – long éclairs, large puffs or small profiteroles. Bake immediately for 15 minutes, then reduce the temperature to 200˚ C (400˚ F) for a further 15 minutes or until they are crispy and golden. Remove the tray from the oven and pierce the side of each cake with a sharp knife to allow steam to escape. Return to the oven for a further 5 minutes. Remove from the oven and cool on a wire rack before decorating. Filling the cakes with the cream before adding the icing reduces the risk of messing up the iced top later. Add the sugar to the cream and whip until it forms soft peaks and holds the shape of the whisk. Fill into a piping bag fitted with a small nozzle. Using the slit in the éclairs made to release the steam, insert the nozzle and fill each cake with cream. Melt the chocolate and butter in a glass or ceramic bowl set on top of a saucepan of gently simmering water. Whisk the two together until smooth and shiny – about 1 minute. Allow to cool a little before using – it should stick to the back of a spoon without dripping. Dip the top of each cake into the icing and rotate slightly to ensure the top is full coated. Place back on the wire tray and allow the icing to set before eating. Never fails. When you think you have all the time in the world, guess what! Glad you got them done. They look so good. Copying your recipe. Ah yes – that takes me back to those salads at Nana Molloy’s….there were always a couple of huge spring onions (‘scallions’) which would burn the mouth off us before the cakes would arrive…You always went for the eclair, and I, having a much sweeter tooth, would often choose the mille feuille (or vanilla slice as it was called). Still, we had to meticulously half them and share them, an exercise which IMO nurtured the worst kind of sibling rivalry. These days I never make my kids do that…! This might sound a bit ‘Little house on the Prairie’, but I try and encourage them to offer the other person their choice first…not easy with small kids but when the reward is the promise of more cakes tomorrow, who can resist?? I will have to try these – they look awesome! – Great photos too – can almost taste the chocolate…. Yeh, the problem with Nana’s spring onions was that it would be well past spring and the bulbs of a fully grown onion would already have begun to form. They were just too hot for little girls. Sounds like there’s some nice sharing going on in the Pattersons! I don’t know about your household, of course, but I feel that the halving and picking being separate endeavors was a really good thing. If we were allowed to halve them and pick them ourselves, we were sure to make our own half more like a 3/4ths! I think it was a good exercise in sharing and we learned how to be meticulous, which can be a useful skill. I tend to agree. Sharing is an essential life skill. We won’t always receive equity – equitable giving won’t always result in equitable receiving – but I still think we should be encouraging kids to give at least equitably or, as Audrey has suggested, to give away the bigger half (or the whole thing!) without feeling hard-done-by. I think these ones might just change your mind. The dark chocolate and the eggy pastry takes down the sweetness you can sometimes get in cream cakes. Yum, yum! Thanks! They really were delicious and worth the effort!